For the first time, Faith will be traveling with me without mommy. Guess who is the nervous wreck here? If Faith needs to go to the bathroom, it's easy. I just bring her to one of the stalls in the Men's Restroom. I have been scratching my head for the past month trying to find a solution to that. Maybe I should not drink water the entire day until I get on board the plane. ask one of the air stewardess to look after her for awhile! :) It's in the plane, should be quite safeee. Get the airport staff to help. But how come Gab and wife not coming home too?? Jaslyn, Heather, Aloe, HiaoAunty: Like I mentioned on my blog, not drinking water until I get aboard the plane. My concern is at the airport. I would have been less paranoid if it were Hong Kong airport. This time I flying from ShenZhen. Yes, please don't drink and you wont die! sunflower: That's true and probably what I'll be doing. Spinnee: Alamak. Another one. The pee part is when I am on the ground at the airport lah. In the plane ok liao. 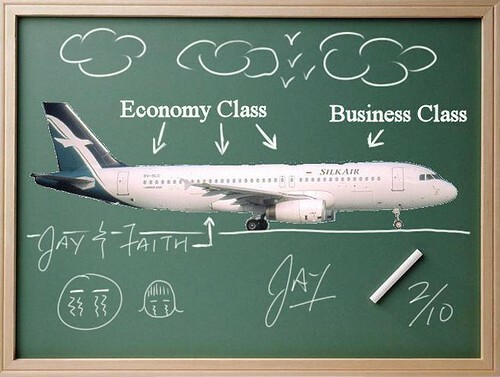 All the xmm stewardesses will be queuing up to take care of Faith! Aiya, don't drink water the night before, and empty your bladder before going out lor. Should be able to last ba. Otherwise, cross your legs lor. Ooooh. Got one way, bring her to the toilet, go into the stall, make her face the door while you face the toilet bowl and pee. Not bad an idea? hahaha.. If cannot find airport staff, get the security guard or go to the excess baggage counter and get the staff to help loh. Spellbound: Er... got one problem. Gabe's diaper too small for me. -_-"
There's this thing called adult diapers!! LOL!! people might think that you have a bulge front & back after some beer drinking session. Spellbound: Bulge?? Cannot!! After all the work I put into gym?? How can??! i got a qns .. where is ur tai tai ?? how come not joining u 2 ? hmmmm - worst case , get u seat nx to the toilet lol..then u wont have to worri faith will b alone for too long..